We are celebrating the Nativity–the birth of Jesus Christ–the incarnate Son of the living God. In the name of the Father and the Son of the Holy Spirit, our God is one. In the beginning was the Word and the Word was with God and the Word was God. All things were made by him and without him was not anything made that was made. . . . And the Word became flesh and dwelt among us and we beheld his glory, the glory as of the only begotten of the Father. This was not a new person coming into the world. It was the person who had made the world. The Lord God had already been around for ages. This Jesus is the same Yahweh who had lead Noah and the ark through the waters, when in this baptismal flood the world is cleansed of its sin, humanity is restored, and Noah becomes your father, and your father, and your father, and mine. This Jesus is the same Yahweh who led Moses and the 2 million Israelites through the path of the Red Sea and then closed up those waters to drown the enemies of God’s people. This was the same Yahweh who had commanded the building of the Temple, the forming of the golden cherubim in the holy of holies, the golden Ark of the Covenant. It was the very finger of this Christ–the same one would later write in the sand among the Pharisees–it was his finger that wrote the 10 Commandments in the stone when Moses was on the mountain. This was not a new person coming into the world. This was God himself–the same God that his people had been praying to, and sacrificing to, and worshiping for millennia. This was not a new God; this was not a new person. So what’s the big deal? They could pray to him already. They already had liturgies, they already chanted the Psalms, they already had incense. Much of how we worship today in the Orthodox Church is like the way we worshiped in the early church, and is in many ways the same as the way the Jews worshiped even before the birth of Christ. We chant the Psalms, we have incense, the priests and the clergy have robes, there is liturgy, there is iconography. Did you know that in a lot of ancient Jewish synagogues, they were not iconoclasts, but they had images of Moses and the various saints and angels in their synagogues. Archaeologists have found these; we have pictures of them. So much stayed the same. What was new? What was different? What was new was the flesh and the blood with which the Word of God clothed himself when the Word became–no longer just God–but when the Word became man. That was new. You see, when we bow down, when we worship our God, we have pictures of Christ the King–Christ our God. In the Jewish synagogues, in the Old Testament times, I guarantee you they did not have any images of a man which they worshiped as a god. “Blasphemy!” is what they would’ve said if you had tried such a thing. And it would have been blasphemy, for until the incarnation, God was spirit and nothing more. But at the incarnation, when Gabriel appeared to Mary and said, “Hail, highly favored one!”, and something holy was conceived within her when the Holy Ghost came upon her, now God became man. 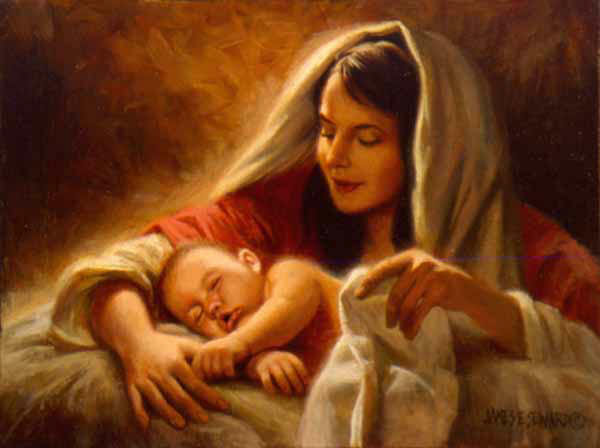 And over those next nine months, the Word became flesh and dwelt among us. Over those nine months, in her womb, Jacob’s ladder extended down from heaven and took its place right here on our planet. And we see angels ascending and descending upon the son of man. The incarnate Lord draws to Himself all who are humble, both rich and poor, virgins and parents, angels and animals, kings and shepherds. The purpose of Christmas is to create the Church. In those nine months the Second Person of the Trinity, now no longer merely a spirit, no longer just God, he now has a human soul, a human will, a human mind, human flesh, and human blood. And that is very significant to us today, because remember what Jesus said thirty-some-odd years later in John chapter six, when he’s talking about giving his flesh for the life of the world. See, he came to bring us life. He had given that first life to us in Adam when he had formed the clay into the form of a man, and then <<blowing>> he breathes into it, and now Adam walks around. And then he does the same thing to his church after he ascends, when from heaven, <<blowing>> he blows the Holy Spirit, and the Holy Spirit rushes among us, and we are filled with the life of the Third Person the divine Trinity. Jesus gave his flesh for the life of the world. Now all of us here, being Christians, how many times have you heard people say, “Let’s put Christ back into Christmas!” Well, first of all, he was never taken out of it. It’s just some people out there don’t recognize that. But by all means, we need to keep Christ in our celebration of Christmas. But see, there’s a second part of the word “Christmas”. It’s “Christ-Mass“. That’s where the word comes from! 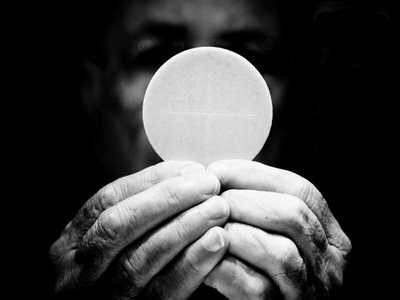 Let’s keep “Mass” in Christmas–the Eucharist–the body and the blood of Christ by which he gives life unto the world. You cannot have Christmas without Christ. You cannot have Christmas without the Mass. That very flesh, that very blood, by which he sanctifies us and cleanses us–and is the medicine of immortality for us–that is the flesh that he took upon himself in the incarnation and displayed to the world in humility at the time of his birth, when the three wise men and the angels and the shepherds and Joseph and Mary bowed down to Jesus. They were not bowing down to a new person, they were not bowing down to a new God, but they were bowing down to God who had taken on new flesh. They had icons and statues. They believed in one God. But there is something they did not have. See, if you were to go to the Temple before the coming of Christ, there would be no Eucharist. That is what changed in Bethlehem. He brought his flesh and his blood to the world for its life. Thirty-three years later, that same little baby had grown up, and he stretched his arms out, and he gave that flesh and blood for the life of the world. He came to die, which is why if you look on icon of the Nativity, oftentimes you’ll see little baby Jesus wrapped in grave clothes. He was born to die and to rise again. So tonight, let’s keep all of Christmas. We will remember Christ. But how will we remember him? Not just with carols. Not just with the sign of the cross. Not just with a Nativity scene . . . but with the very flesh that he brought to the world when he became incarnate. Tonight we will remember Christ in the mass–in the Eucharist–and we will receive that life, that eternal life, that he gave to the world in his flesh in the incarnation. This is day forty of the 40 Days of Blogging. For more articles on how Christmas Means the Church, check out these bloggers. This entry was posted in 40 Days of Blogging, Christmas, Fr. Joseph Gleason, John 1:1-3, John 1:14, John 6, The Incarnation. Bookmark the permalink.